We were recently introduced to luxury Belgian coffee brand Belmio which offers a range of Belgian coffees with intensely rich flavours in the convenience of a pod for your Nespresso system. The pods are made of aluminium pods and are an industry first because they enable the coffee to stay fresher for longer for an authentic coffee-house taste. 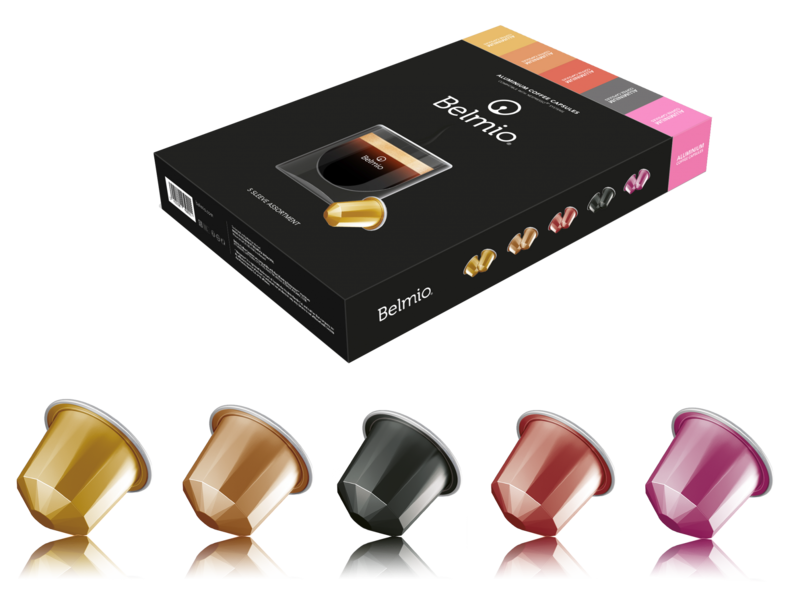 Belmio coffee pods are compatible with the following Nespresso machines – Lattissima, Citiz, Pixie, Maestria, Inissia, Essenza and Magimix. Allegro – a medium roasted blend of Arabica and Indian Robusta beans. The flavour is rich in ‘colourful and spicy accents with hints of pure chocolate and an aftertaste containing a suggestion of honey and wood. Origio – a full bodied blend made from 100% Arabica beans. Intensio – Of South African origin, this coffee is subjected to a very intense roasting process to give a highly powerful flavour and low acidity. It has “subtle hints of cacao and deliciously spicy elements. Risoluto – a darker roast made from a special selection of Robusta and the finest Arabica with spicy accents and a hint of caramel. Largo – an all round coffee composed from the best 100% Arabica beans of Central and South American origin. This one is a slightly lighter roast with a subtle and fresh aroma and “its flavour is soft and full-bodied with sweet and fruity accents”. The Husband’s favourite was the darkly rich Risoluto whilst I preferred the more easy drinking Allegro. It’s clear there’s a lot more to coffee blends than you’ll find in your standard jar of instant and if you have a Nespresso system then Belmio coffees are great for trying new flavours and impressing your guests over Christmas. I have a 50 capsule assortment comprising 10 pods of each of the coffees mentioned above to give away – plenty to see you into the New Year to brighten those grey January days! Entry is by the Gleam widget below and the giveaway ends at 11:59 pm on Saturday 30 December. UK entrants only and terms and conditions apply which you can find on my giveaways page. Check that your Nespresso coffee maker is compatible before entering (see above). "Our 5 Must See Places In Mexico"
I drink way too much coffee but I can’t start the day without a cup of tea. love my coffee – I have between 2 and 5 a day, depending on what I’m doing or who I’m with. I do like coffee although don’t drink it often as I like it sweetened . They seem to have a great range of coffees to choose from. Too many as I love Coffee so much . I do love my coffee! This is a great prize. good luck everyone! I love coffee and need at least two cups before I can get going in the morning! These sound perfect. I love coffee pod machines, it’s always nice when you have one in a hotel! Nice competition Linda! I really like good quality coffee, and find that Nespresso is a good standard. These Belmio sound delightful. I’m easily a 6 cup a day kind of girl. 2 or 3!!! depends how tired I am!!!! A lot, I couldn’t live without my coffee. Congratulations – you are the lucky winner! I tend to enjoy a coffee ( one) following an evening meal. Whilst my brother and friends drink coffe about 3 or more times every day. I drink five caffienated and about ten decaf!! Usually a couple in the morning. Usually three. One for breakfast, one mid-morning and one after dinner. I usually have 3 or 4 cups of coffee a day. Thanks for the competition. Probably more than I should! But usually around 3-5 a day. one cup a day then Im a tea drinker. But would not miss my one cup.. I would love to win this comp !!! I love coffee, can’t start the day until I have had a cup. None, but my mum has at least 5 and would love this! I drink 2 or 3 cups a day, of instant, so would love to try these special coffees. I drink about two coffeess a day! Probably too many, around 4 or 5. Too many to be honest, about 5, but I don’t like tea ..